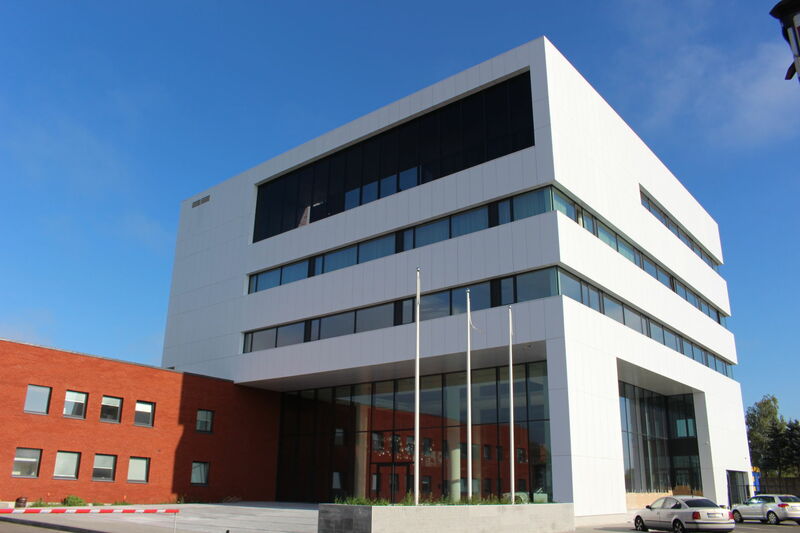 New premises for SCT Lubricants Office was completed in Lithuania 2016. 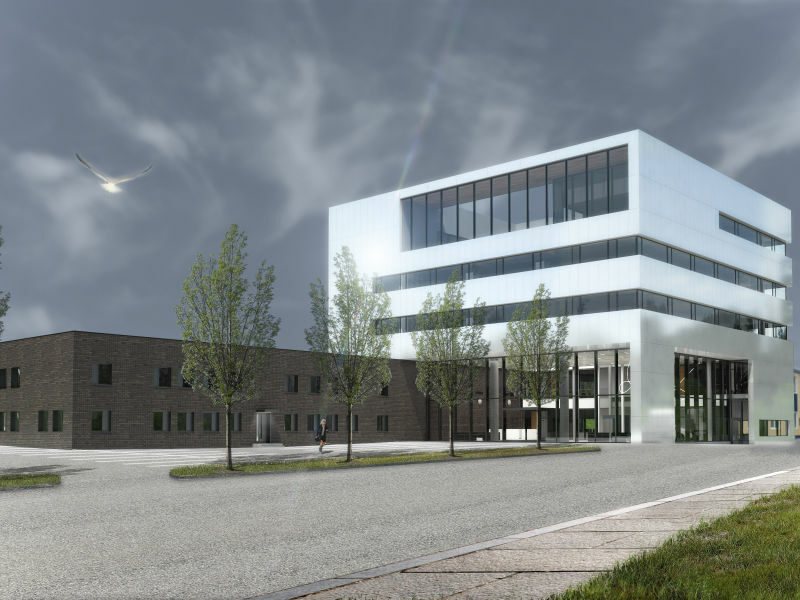 Peikko’s DELTABEAM® was used in the construction of the premises in order to cover big openings with minimal beam. In the construction of the SCT Lubricants Office, the main challenge was to cover large openings with minimum beam height. Cantilevers holding the facades were 4.6 meters long. The biggest span between floors totalled 18.35 metres. 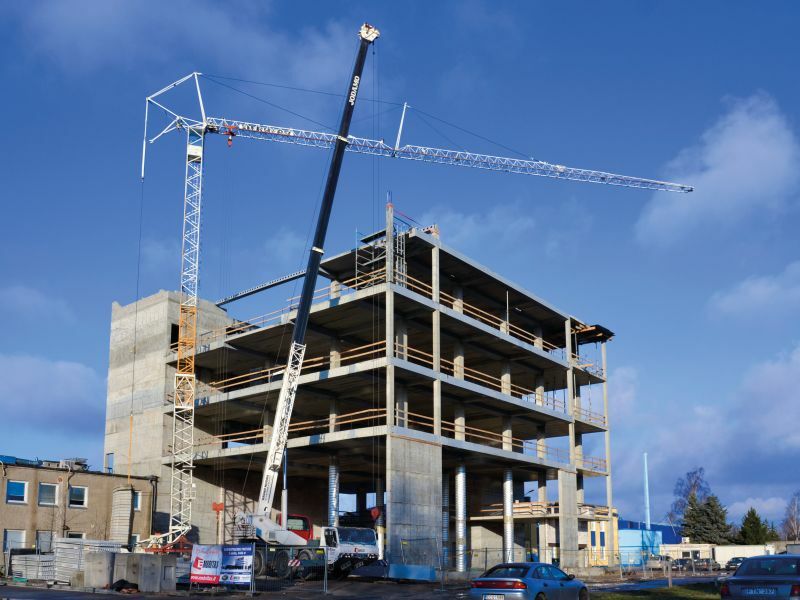 DELTABEAM® Composite Beams were placed in level with floor slabs. The longest beam on the top floor was 23.1 meters long. Various reinforcement products and connections, PSB Punching Prevention System and Bolted Connections of Peikko were also used. They helped to reduce the thickness of the slabs and made its reinforcement installation faster and easier. 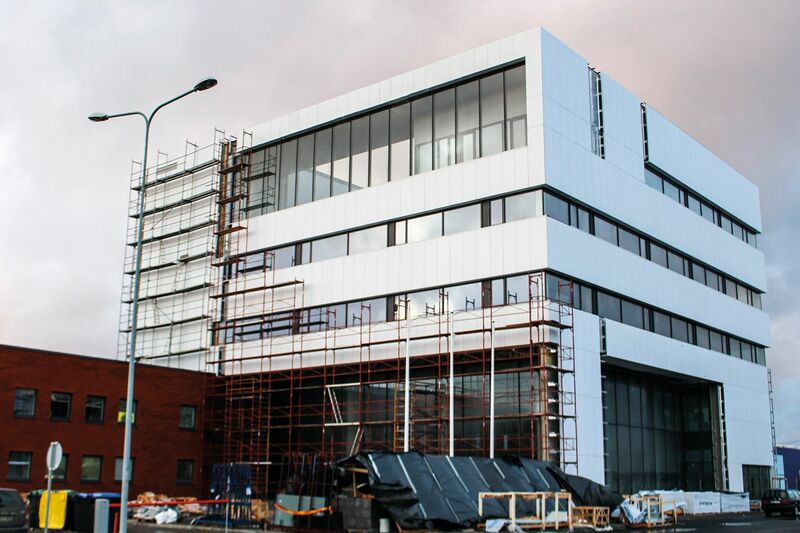 “DELTABEAM® did the covering job perfectly,” said Martynas Urbikas, owner and Chief Structural Designer at Struktūra ir Forma. “There are no equally good solutions in the local market compared to DELTABEAM® in terms of load bearing capacity and light weight of the beam. These solutions were gladly accepted by architects, investors and construction companies here,” he added. 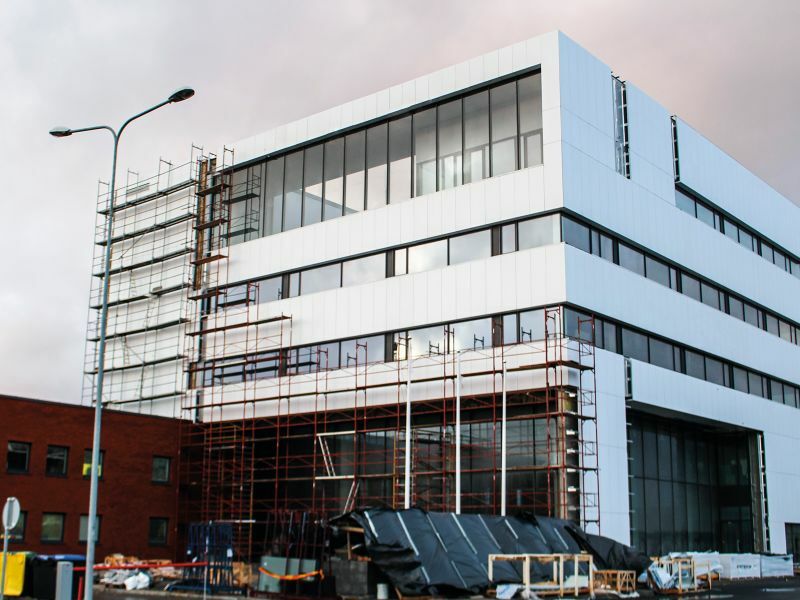 Peikko Group’s Lithuanian subsidiary Peikko Lithuania has been working with Struktūra ir Forma since 2006, and has completed many different projects together. “We first met Peikko Lithuania in 2006, during first common project at Birutės al. 26, in Palanga city. I approached Peikko as I needed special solutions and had come across DELTABEAM® on the internet. 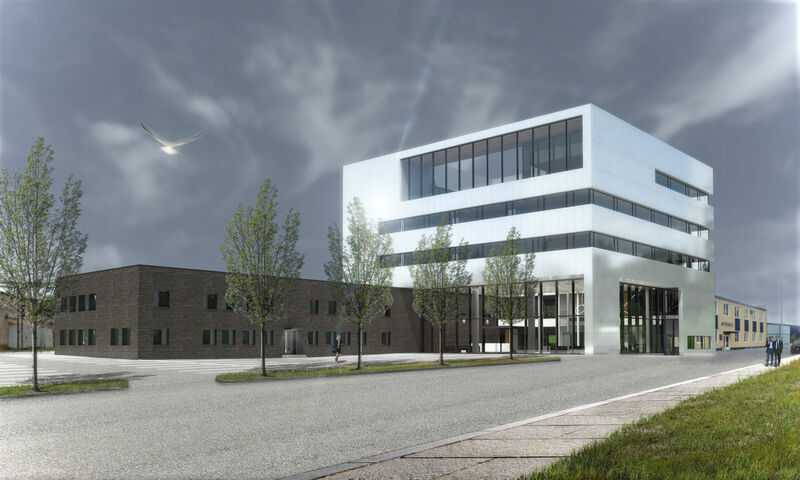 We have now been using Peikko’s solutions for 10 years already - including Column Shoes, DELTABEAM®, various fastening items, lifting items, PETRA® Hollow-Core Slab Hangers and so on,” said Urbikas. He also noted experience in using DELTABEAM®, a solution familiar for himself, made the process at Klaipeda particularly smooth. “For the SCT Lubricants Office I used Peikko’s solution knowing its possibilities and advantages very well. Therefore tackling architectural challenges of the project was much easier. 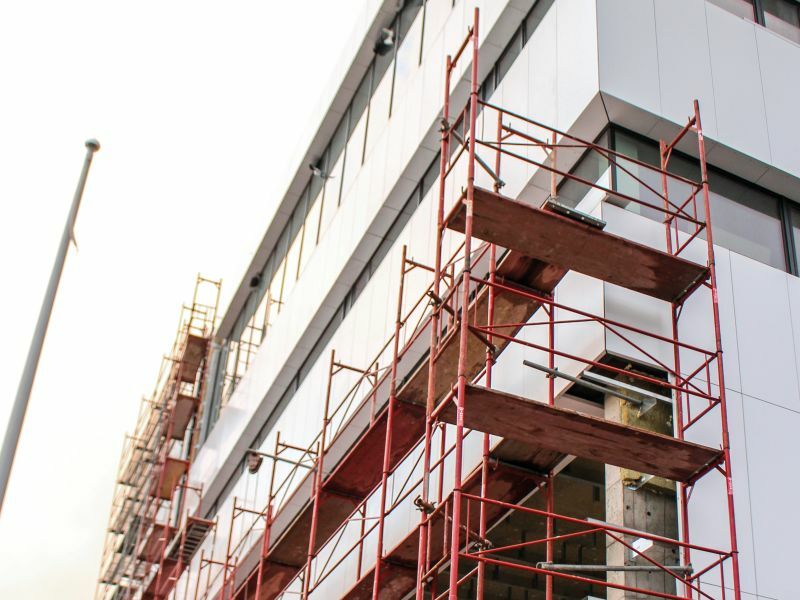 DELTABEAM® solution provides new possibilities in design of different and interesting buildings, and save construction time and costs,” Urbikas said. 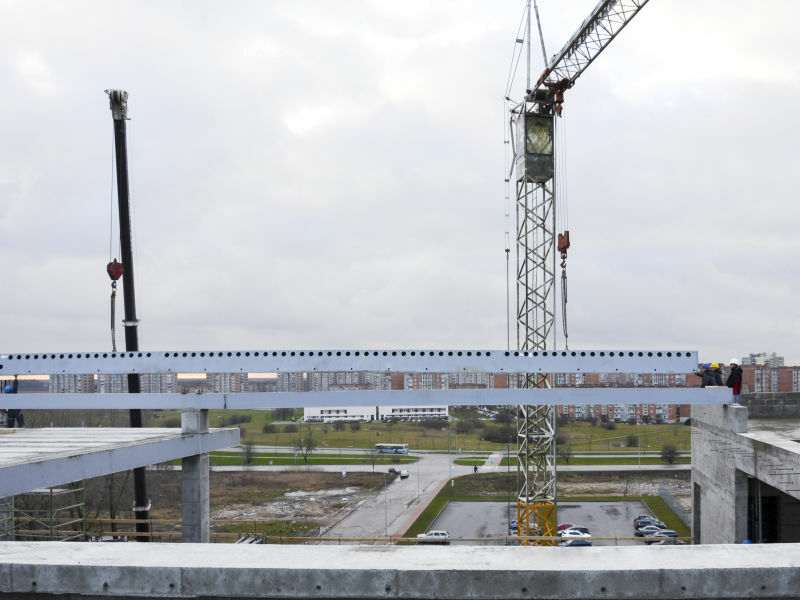 Some 365 meters and 30 pieces of DELTABEAM® were used for the project together with Peikko’s Punching and Shear Reinforcement elements, and Fastening Plates. 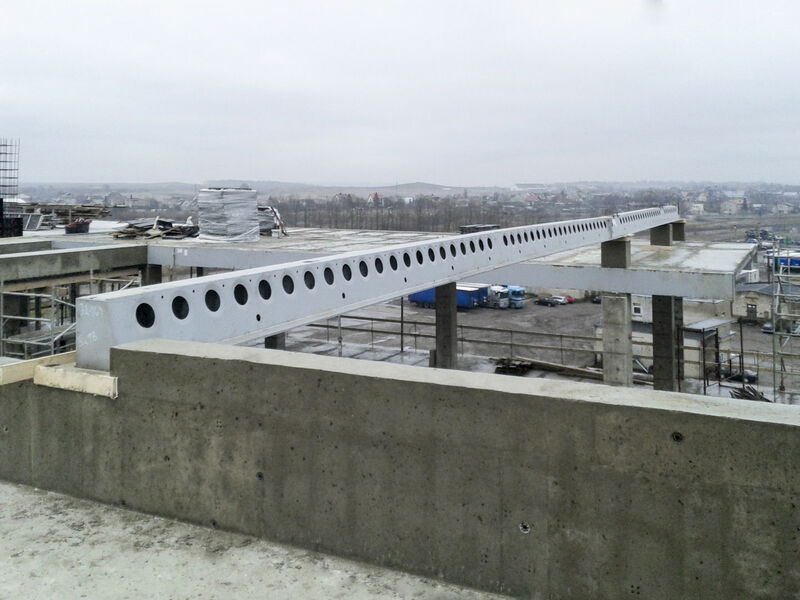 DELTABEAM® Composite Beams were manufactured in Peikko’s factory at Kralova nad Vahom, Slovakia. All deliveries were oversize, which caused a few logistical challenges. 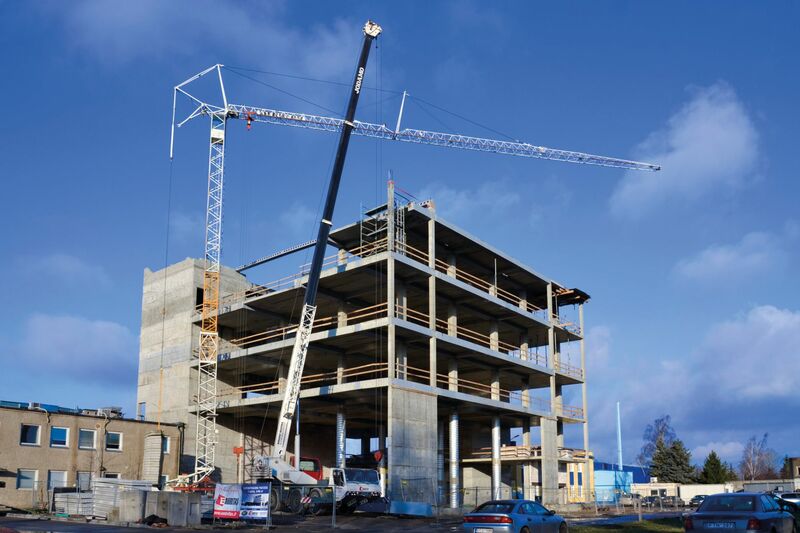 For example, when the longest DELTABEAM® which was 23 metres long was delivered, some part of street next to the building site had to be temporary closed while truck reached the construction site. 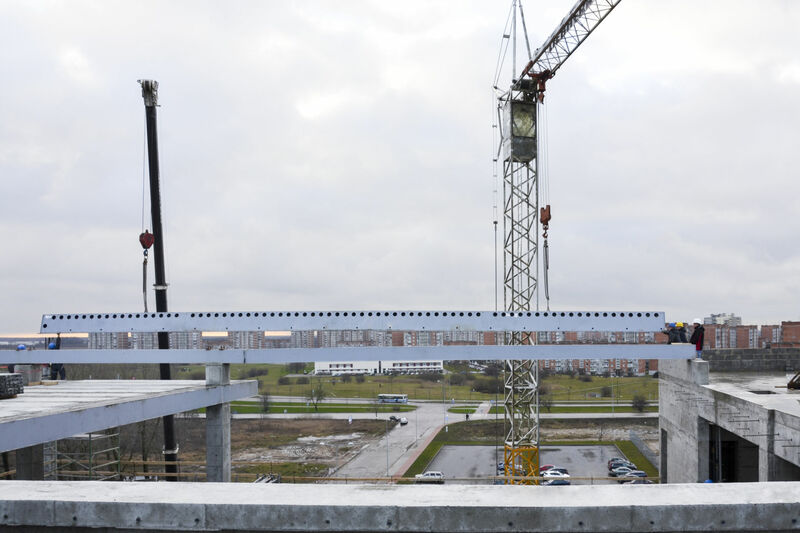 At the construction phase, the biggest challenge, however was to install the longest of DELTABEAM®, a 23.1 meter long beam at a height of 21.5 meters. Two cranes were used at the same time for the installation work. DELTABEAM® was combined with cast in-situ concrete beams, holding together hollow-core slabs. DELTABEAM® calculations were done by Peikko Lithuania, it is part of Peikko’s service to structural designers in the DELTABEAM® design process. 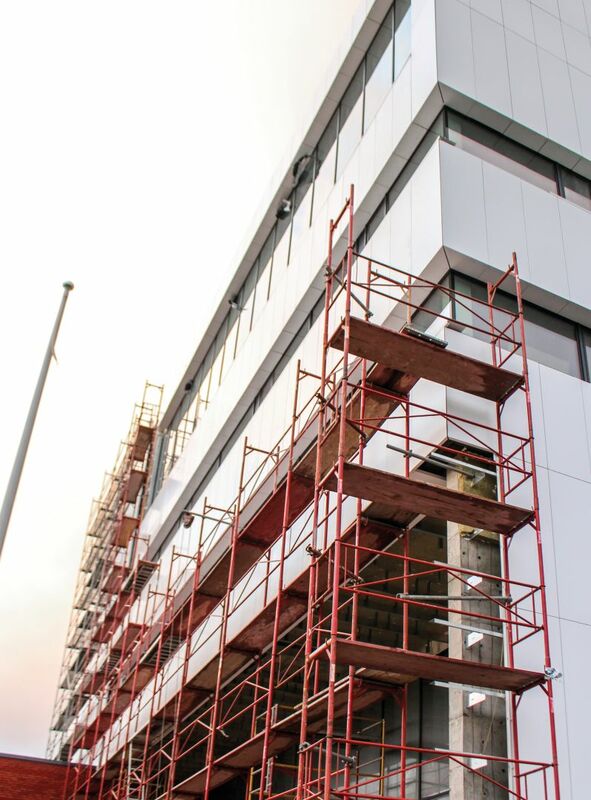 “We have very powerful internal calculation and dimensioning tools in use and it makes it possible for us to visualize deflections of the whole beam, a fact that turned out to be very handy in this particular project,” said Linas Lelesius, Sales Manager at Peikko Lithuania. Senior structural engineer Paulius Kugelis of Peikko Lithuania notes it was very challenging to design column-DELTABEAM® connection as eight pieces of main reinforcement bars of column passed through the DELTABEAM® cross-section. “It was also challenging to calculate the deflections of DELTABEAM® cantilevers, which were 4.6 meter long and make design of those beams. Deflection of cantilever end had to be within special range, because of facade elements, which had to be used. Another very demanding task was to calculate natural frequency of floor slab. Slab had to be acceptable for vibration performance,” Kugelis explained. Martynas Urbikas noted cooperation with Peikko proceeded smoothly. “All products we ordered were delivered on time and were of expected quality. With all my good experience in those years and trust in Peikko, I see no obstacles in the future working with them together solving challenging structural situations,” Urbikas concluded.